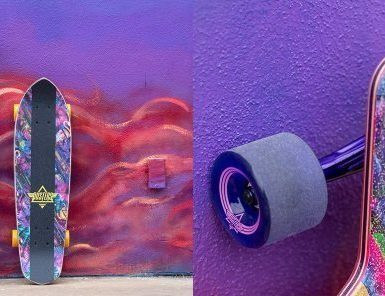 Longboard vs cruiser : what's the difference ? Longboard vs cruiser : what’s the difference ? So you’re on the market for a longboard. You’ve already ruled out the street skateboard option because you need something more versatile and comfortable to ride, and you’re not into pure trick skating. You mostly want something you can cruise and commute on, on a daily basis e.g. to the train station, or just for riding to the store or to the park. But when scouting the available options online or at skate shops, you’re at a loss on whether to pick up a “longboard” or a “cruiser”. So what’s the difference between a longboard and a cruiser ? A cruiser refers to a shorter and more lightweight board which is responsive and maneuverable enough for riding in tight inner city areas. A full size longboard, on the other hand, typically turns on a wider radius but is generally more stable at faster rolling speeds, making it a better option for traveling long distances, open road commuting, and riding down bigger hills. The above definition alone is probably not sufficient to help you decide on which of the types of board you need. We have to take a closer look at what it means to choose a “cruiser” vs a “longboard”. Let’s clear up something first : the term “longboard” designates any 4-wheel board that’s not specifically a traditional street (aka “trick”) skateboard. “Skateboard” normally means the symmetrical, popsickle-shaped decks with 2 kick tail mounted on traditional kingpin trucks with small hard wheels, well-suited for ollies, flips and rail grinds. Longboards are typically bigger than skateboards – bigger decks, bigger trucks, bigger wheels. That’s what distinguishes the two. Being larger, longboards are more comfortable and stable to ride. OK now, what about cruisers? A “cruiser” really is any longboard whose configuration is optimized for cruising, i.e. pushing and going places. This definition is not very useful, though, because it applies to a very broad range of longboards all sizes and shapes! 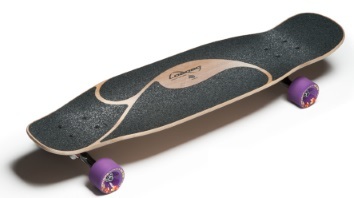 By “cruiser”, what we generally mean is “mini longboard” or “mini cruiser“, referring to a shorter board. 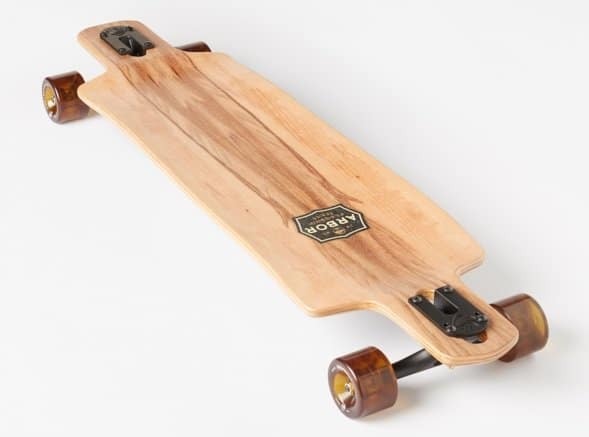 Thus, opposing the term “longboard” to “cruiser” now starts to make sense: in this context “longboard” refers to boards that are longer / bigger than mini-cruisers. One last thing on this: a cruiser (really a mini-cruiser) can be similar or even smaller in size than a street skateboard. The wheels and deck shape may be the only things that distinguish the two types. Now, let’s dive deeper and look at how different a cruiser and a longboard really are. Let’s talk about how longboards and cruisers differs in terms of riding style. What’s the point in having a cruiser category on the longboarding market in the first place? That’s simply because cruisers fulfill the need for something in between a street skateboard and a full-size longboard. Lots of skaters like to skate for daily city commutes and casual city cruising. For crowded and congested city streets and sidewalks, street skateboards have always been more nimble, and less cumbersome and lighter to carry around than those heavy bulky 38″ or longer longboards. If you’ve ridden a street skateboard before, however, you know how uncomfortable and slow these boards are to cruise on because of the strong vibrations and shocks you get from the small hard wheels and stiff deck. Enter the mini-cruiser to fill this void: they’re agile and portable like a skateboard, but with some of the riding comfort you get on a full-size longboard. This is mainly due to the wheels which are larger than a street board, and typically a more comfortable shape. A cruiser’s primary usage is short-distance transportation. Moving through the city, navigating around things and people on sidewalks and busy streets. It’s small and lightweight and easy to carry around everywhere: into a store, at the office, at a restaurant (under the table), on a bus, train… It fits in the overhead compartment of a plane. Full-size longboards, on the other hand, are heavier and bulkier. But: they are stable and smooth riding over longer distances and at higher speeds, like on country roads. They generally allow for more efficient and effortless pushing. Because of their size and weight, they can pick up speed quick and go fast. They also handle higher speeds well, which makes them a good choice for riding downhill. On the flip side, bigger boards have a larger turning radius, and so they’re not as nimble as a cruiser in a constrained space. The number 1 diffentiating factor between a cruiser (i.e. mini-cruiser) and a longboard is deck size. Cruiser decks are typically no longer than 34″ (often 28″-32″) and narrower (< 8.5). The Landyachtz Dinghy, a very popular cruiser (read my full review here), has a deck size of 28.5″ x 8″. Longboard cruisers, on the other hand, typically have decks 36″ to 42″ long and 8.5″ to 10″ wide. Why is it important? Deck length and wheelbase (distance between front and rear trucks) impact the board’s ability to turn. Shorter cruiser decks allow the board to turn “on a dime” making easier to avoid cracks and obstacles. Bigger longboards have much wider turning arcs. On the flip side, a cruiser is often much less stable than a full-sized longboard, particularly at higher speed. The short wheelbase, combined with loose trucks (see below) often leads to speed wobbles when going down steep hills. Longboards are much more stable at speed due to their longer wheelbase. Flex varies a lot for longboards in general, but some flex helps makes cruising more comfortable om rough terrain, easier on the joins, and helps with carving. Cruisers often have a stiffer deck to allow for more pop when using the kicks. Many cruisers have a surfboard-like shape, asymmetrical with a squared or rounded square (“squash”) tail in the rear, and a pointy-ish nose in the front. They often have a kick tail – and sometimes a small nose kick – for doing kick tricks and manuals, and popping over small cracks. That’s another thing with mini-cruisers : they are so small (close to skateboard size) and lightweight that you can do soft tricks on them as you cruise around the city, such as kick flips, kick turns, hopping on or off curbs. I say “soft tricks” because cruisers are generally heavier than street boards because of their bigger wheels. So while some riders are able to ollie on them, it takes more effort. Again, the main focus of a cruiser is, well, cruising, so the kick tails are mainly there to help you navigate the urban landscape with ease. Some cruisers, nevertheless, are designed with more freestyling in mind than others. A good example is the Loaded Poke, a cruiser with prominent freestyle features like its two full-sized kicks and a pronounced concave. It’s also great for bowl riding. Go here for my complete review of the Poke. Meanwhile, full-size longboards come in varied shapes, but many longboards focusing on cruising are either pintail shaped (first image below) or symmetrical cutout shaped (second image). See this post for more about the different longboard shapes. Longboards may also have kick tails to enable some freestyle or dancing tricks. Generally though, you won’t perform the same kind of tricks on a longboard as on a small cruiser: you’ll focus more on manuals and stepping tricks vs radical kickflips and jumps. Also, you won’t generally take a regular longboard into a skate pool. A cruiser typically has a narrower nose and wheel flares to reduce the risk of wheel rub. Cruiser trucks are generally very loose for fast turning, so having good wheel clearance is essential for tight carving when riding in small spaces. For regular longboards, both topmount and drop-through, wheel clearance can vary quite a lot. Some longboards are meant primarily for distance pushing, focusing on riding fast and far on straight roads, as opposed to continuously carving and turning, and so they have more limited wheel clearance. Others, like the Loaded Icarus, are made essentially for carving and pumping and can take very large wheels without suffering wheelbite thanks to their ample wheel cutouts and deep flares. Check out my full review of the Icarus. The way a board’s trucks are mounted on the deck greatly affects how the board rides when cruising. Most mini-cruisers are topmount, meaning the trucks are bolted underneath the deck. This means cruisers are relatively high off the ground, making them harder to push on – your kicking foot has to drop more to reach the ground, your standing knee has to bend more. Top mount also means less stability at speed because of higher center of gravity. So you got the idea: cruisers are mainly for riding short-ish distances, they’re not that well-suited for long distance skating because of their topmount design and small wheels. Cruisers are generally not the best choice for downhill speed. A full-size cruising longboard, on the other hand, can be either topmount (like most pintails) or drop-through – where the trucks traverse the deck through holes. A pintail longboard, such as the Sector 9 Lookout, will be tougher to push on for long distances and less stable at speed than a drop-through longboard, but it will be faster-turning. A drop-through longboard will be more stable at downhill speed. In general, a longboard will rarely be as nimble as a typical cruiser due to its size. Mini-cruisers typically run traditional kingpin (TKP) trucks, which are street skateboard type trucks. Regular longboards, on the other hand, typically use reverse kingpin trucks (RKP). TKP trucks are designed to respond to very small movements of the feet, making them well suited for boards with kicks riding at lower speeds. TKP trucks have more “dive” than RKP, meaning as you start leaning into a turn, the board initially starts turning dramatically, then turns more slowly as you go on. 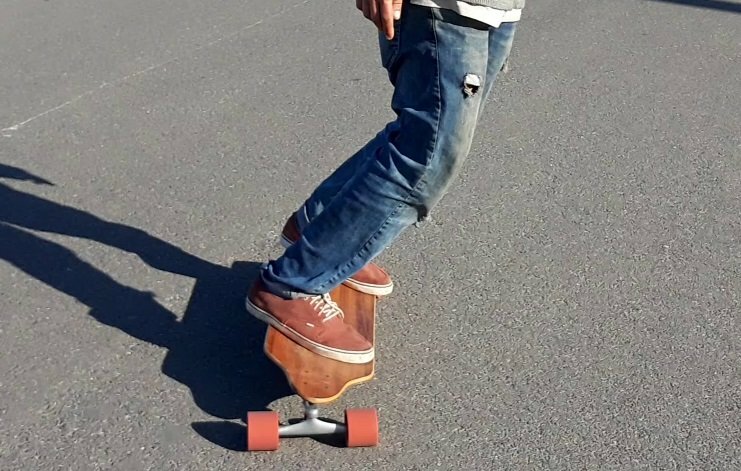 TKP trucks are shorter than RKP, so on a cruiser this partly offsets the ride height caused by the topmount design, making it easier to push than on a longboard. Besides wheelbase length, RKP trucks (e.g. Paris, Randal, Caliber) are what make longboards more stable at higher speed since they’re designed to respond slower and deeper. Turning on them requires leaning harder. TKP are twitchier and more prone to wobbles. Truck size on a mini-cruiser varies. By default, the Dinghy runs very narrow 105mm Polar Bear trucks, making the board very reactive and fast turning, but not nearly as stable as with a bigger truck. These trucks, however, match the Dinghy’s small deck size. The Loaded Poke, on the other hand, is a bigger cruiser that comes with RKP trucks in either 150mm or 180mm in size, similar to a regular longboard. Because of this, the riding feel on the Poke is quite different from the Dinghy, less twitchy but more stable. Note that the Poke can also be set up with carver trucks, which makes for a totally different experience (see this article about surf skateboards and this one about carving longboards). 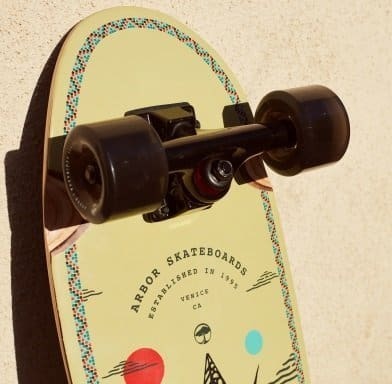 Cruisers often have small wheels by longboard standards, typically in the 55-65mm range, matching smaller trucks and a smaller deck – bigger size wheels cause wheelbite. Smaller wheels also help keep the board’s weight down. Cruiser wheels are generally bigger than on a traditional street skateboard, though, which are typically around 50mm. Most importantly, wheels on a cruiser are usually on the soft side, with durometers between 78A and 82A. Soft wheels are better for cruising because they help absorb shocks, particularly on uneven terrains, and offer better traction when carving. Some riders prefer to use slightly harder wheels which are more slideable and roll faster on smooth surfaces (less friction). Urethane quality also plays a role. Some wheels such as the Fatties Hawgs 63mm provide good balance between smoothness / roll speed and sliding ability when riding a mini-cruiser. In comparison, wheels on a full-size longboard used for cruising are typically bigger, starting at 70mm. Distance pushing longboards can run wheels up to 85mm provided the deck has enough wheel clearance – this is generally the case in boards 40″ or longer, or shorter boards with bracket setups (e.g. Gbomb push/pump setups). Bigger wheels roll faster, which is part of the reason why longboards can get to higher speeds. Like mini-cruisers, most longboards fit for cruising run softer wheels for good grip and better cushioning on rough terrain. Freeriding and freestyling require harder wheels for sliding. So to recap, what’s the difference between a cruiser and a longboard, and which to choose? A cruiser is great for riding short distances in crowded or congested areas. It’s small, lightweight, easy to carry around and take with you everywhere. A cruiser is not so well-suited for traveling far or for riding very fast. A longboard is more stable and comfortable for pushing long distances and for riding downhill at higher speeds. It can have a much wider turning radius than a cruiser though, is generally longer, heavier and more cumbersome to log around and store. Both cruisers and longboards can be used for freestyle, depending on the type of tricks you do. Some cruisers are good for bowl riding, while longer boards with kicks are suited for stepping tricks / dancing. If you’re into heavier freestyling, however, consider getting a street deck or a “hybrid” longboard.